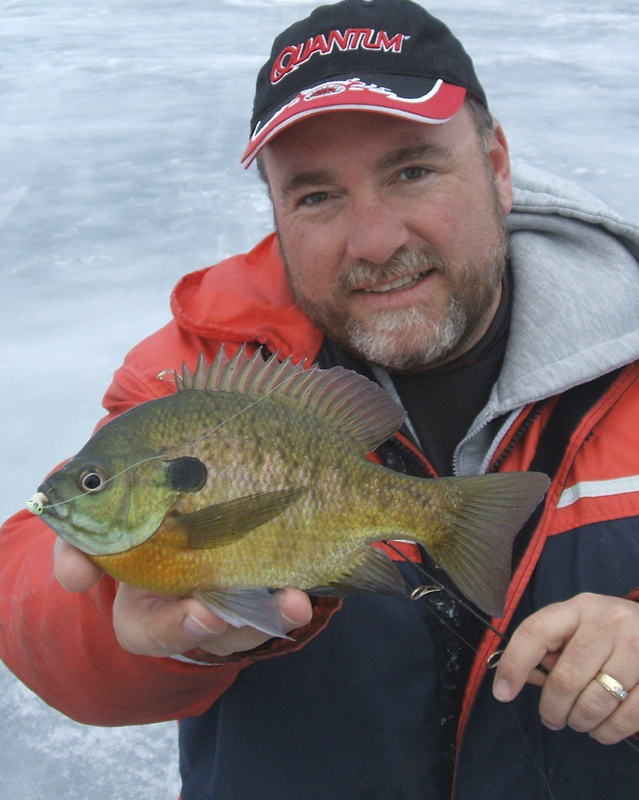 Quite possibly the best ice fishing opportunities in the world for yellow perch, bluegills and crappies is happening right now in southern Ontario. Especially in and around the Kawartha Lakes and in south-eastern Ontario, in the swath of land and water between Kingston and Ottawa. A lot of the credit for the phenomenal angling has to go to Ontario Natural Resources biologist, Scott Smithers. Smithers picked up the ball a few years ago and almost single handedly spear-headed a drive to bring the outdated, antiquated and obsolete panfish regulations that were in effect in Fisheries Management Zone (FMZ) 17 into the modern era. Credit also is due to a bunch of die-hard anglers who leant their support. Hot sticks like Pete Garnier of Lindsay, Ontario and Lonnie King of Ottawa, Ontario. And lets not forget legendary anglers, and good buddies, Al and Ron Lindner, who brought a much needed, common sense, wake up call of .... been-there, seen-the-consequences, don't-do-it-in-southern-Ontario .... realism to the situation. There is no question the new regulations still need some tweaking and fine tuning - I mean, who in their right mind needs 30 crappies a day - but the foundation has been established for enlightened management and even better fishing in the future. Although if you listen to Garnier and King these days, you have to ask yourself, can it get any better? Lonnie, for example, is catching the beejeebers out a huge 14-inch plus black crappies and dinner plate size bluegills in the Ottawa area. We've been comparing notes and patterns back and forth, on how the crappies in our respective parts of the province are behaving and it is fascinating to see the differences, given we live 1000 miles apart. What strikes me as most interesting, however, is that Lonnie, who is a regular contributor to In-Fisherman Magazine, is catching eye popping crappies and bluegills that are relating to shallow vegetation. In Northwestern Ontario, where I live, deep basins are where we find nearly all of the big fish. In fact, virtually no one up here ice fishes for crappies in the shallow, weedy portions of the lake. Hmmm, maybe that needs to change. Lonnie, by the way, is an educator at heart and has put together a series of instructional Youtube videos. Just Goggle his name and you'll find them. Or, send him an e-mail at fishing@ncf.ca or via his Facebook page. Pete Garnier is another kindred spirit. I met Pete for the first time last year when I was presenting seminars at the Spring Fishing Show in Toronto and we've been e-mailing back and forth ever since. Pete has always been a holly terror on the southern Ontario bass and walleye tournament scene, but lately he has been putting the same kind of effort toward winter panfish and his catches are remarkable. 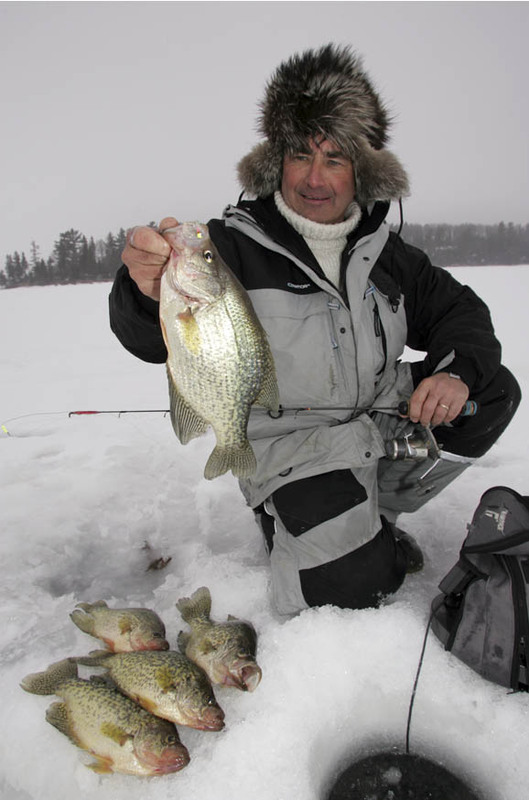 According to Pete, several of the Kawartha Lakes boast world class crappie fishing with fish averaging 13 to 14 inches in size and more than the occasional 17-inch plus bruiser showing up in the net. But are you ready for this: to show you how good this still-emerging fishery is, one day last spring Pete and three buddies fishing in two boats, caught and released over 800 crappies. If you've picked yourself up off the floor after reading that, get ready to fall back over again. The crappies averaged better than 12-inches in length and many exceeded 15-inches. A month later, Pete and his partner won his bass blub's crappie tournament, plunking down a 10-fish limit on the scales that weighed 18.87 pounds! And get this: Pete lamented saying, "we caught no really "big" fish. They were all just clones." Excuse me - no big fish! Like Lonnie over in Ottawa, Pete has also established what seems to be a solid weed-oriented pattern. He says he "typically smashes" the crappies in the weeds during the day, fishing in only 8 - 10 feet of water with maybe 3 to 5 feet of standing milfoil. I did an piece in the current Winter Edition of Outdoor Canada Magazine with reigning American World Ice Fishing Champion, Tony Boshold, and from the sounds of things, Pete and Tony have been reading each other's mail. They're on the same hot pattern. Pete has also noted that at dusk and during the night, Kawartha Lake crappies tend to roam the confined open water adjacent to the lush weedlines. By the way, Pete guides a limited number of anglers and here is a guarantee that you can take to the bank. Hire him for one or two days and you'll learn more about catching winter panfish than you would on your own in two or three years. And you'll have a ton of fun doing it.